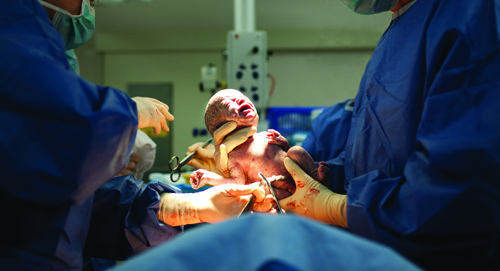 objective to reduce cesarean section deliveries for first-time mothers with low-risk pregnancies. first-time mothers, saying while they can be lifesaving in certain cases, they also pose serious health risks to mothers and babies. The Agency for Health Care Administration and the Florida Department of Health say once a woman has a cesarean, she has a greater chance of having a C-section for subsequent births, increasing her risk of major birth complications. For the baby, some of the consequences can include longer hospital stays in the neonatal intensive care unit, as well as higher rates of respiratory infection. recognized that the high rate of low-risk cesarean births is a major maternal and child health issue in Florida, as the state has one of the highest rates in the nation. UF Health Jacksonville was recognized for this achievement at the Florida Hospital Association’s Celebration of Achievement in Quality and Service Awards.